I have always wanted to host one of those fun Christmas cookie swap parties. 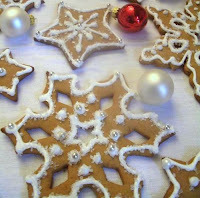 So, for the month of December my Try-It-Tuesdays are going to be just that...Christmas cookies. I would love for you all to "swap" with me, so if you have fun traditional Christmas cookies/goodies that are your favorite holiday treats, please share them Tuesdays (or Thursdays, it's still T-I-T that day and that's probably the day I'll use this week since I'm feeling a little under the weather today.) all month long. Mmmmmm....It's Christmas Time!!! In the first comment on my latest blog post, I put up the recipe for Pumpkin Pie Cobbler with cinnamon/caramel whipped cream. Yum ;)! Hope you're feeling better ASAP! I have Orange Brownies on my blog.. they are sooooo good. I am in an actual online cookie swap. There are four of us in the group - with each of us making a dozen cookies and sending it to the others. Now, I have to figure out what to make!